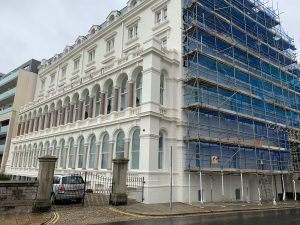 Over the past year we have been delighted to have worked on such an extensive project to provide Plymouth hotel scaffolding for The Grand Hotel on Plymouth Hoe. As with many coastal hotels, the exposure to the elements means that redecoration and maintenance are required to keep the facade looking at it’s best. It was time for The Grand to have a makeover which, for such a large building, is no mean feat. The work was carried out in two phases due to the fact that it was such a large project which needed to be undertaken with minimal disruption to hotel guests. 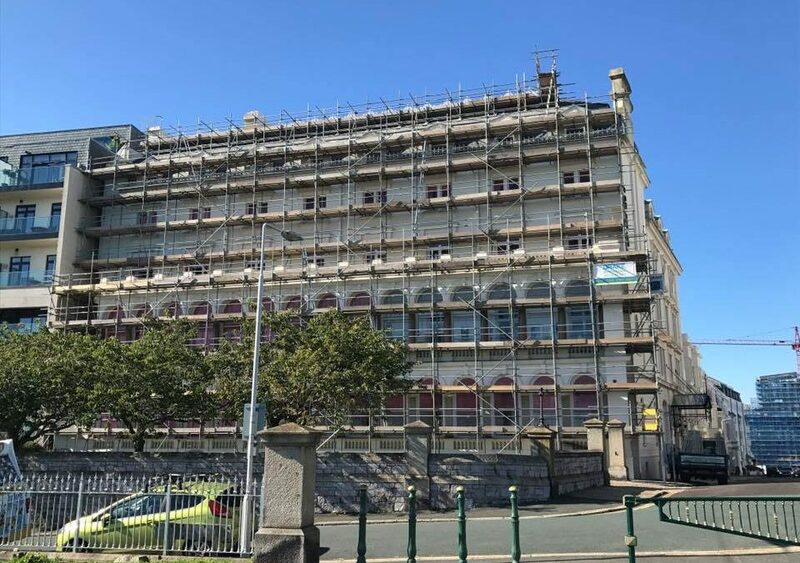 The first phase of this Plymouth hotel scaffolding project was to erect the scaffolding for the front of the building. The front of the hotel was in need of re-decoration, new windows and re-felting of the balcony while the second phase to the rear was painting, windows and chimneys. The images give you some idea of the scale of the project and, as usual, the team worked to the strict requirements of health and safety procedures. At Drake Scaffolding we understand how important it is for clients like The Grand Hotel to maintain the day to day running of their business without impacting on the guests. As it is such a busy hotel, in such a busy location, the work has largely been carried out in the quieter season to avoid disruption to residents. The two phases has also meant that only one side of the building is affected at any given time. We are delighted with the outcome of this project and can’t wait to see The Grand after it’s makeover. If you are carrying out work on a hotel or other large commercial building across Plymouth and the South West and need the services of an experienced and dedicated team of scaffolders, we are confident that you won’t find better. Give us a call on 01752 719515 to discuss your requirements.